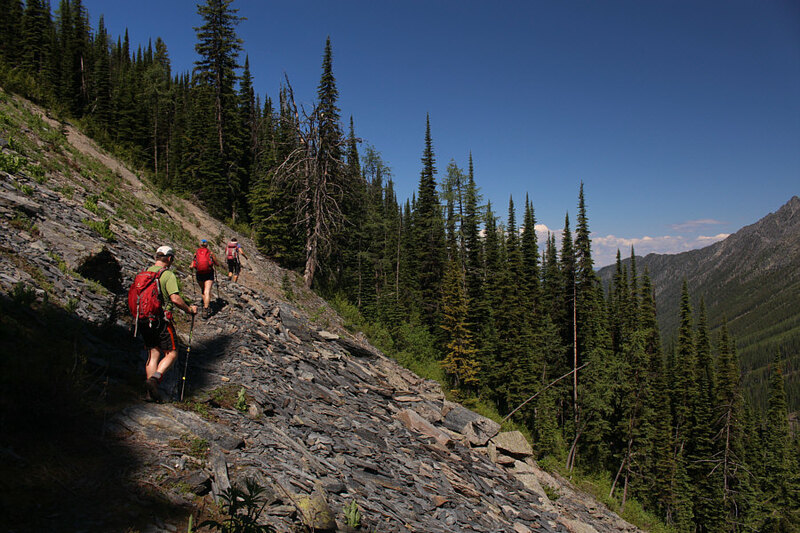 On 2 July 2017, Eva B., John Bence, Zosia Zgolak and I hiked the Five Passes loop as described in Janice Strong's Mountain Footsteps: Hikes in the East Kootenay of Southeastern British Columbia. Meeting at the A&W in Cranbrook, British Columbia, we initially drove out in two separate cars because John and Eva were planning on heading elsewhere after this trip, but the Mause Creek Forest Service Road (FSR) turned out to be rougher than expected. 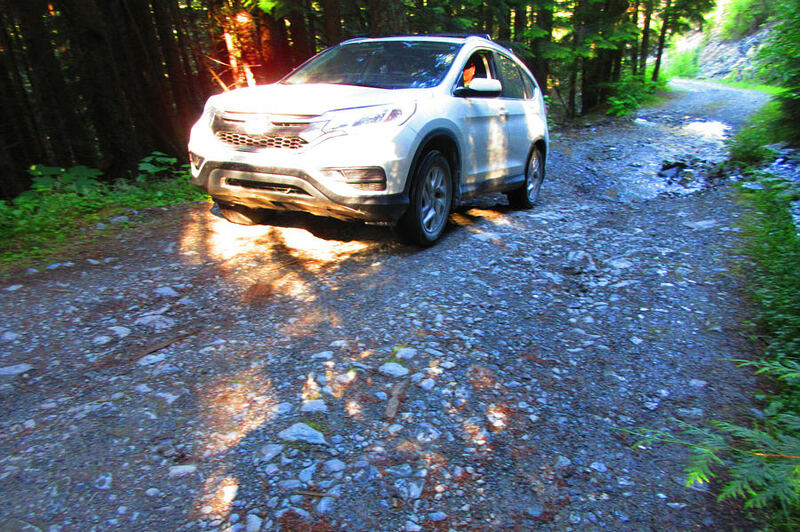 I managed to make it as far as the Mount Fisher trailhead in my Honda CR-V before we decided to consolidate passengers and drive the rest of the way to Mause Creek trailhead in John's Jeep Cherokee which has higher clearance. While we were transferring gear between our two cars at the Mount Fisher trailhead, a Toyota Tacoma carrying four hikers and two dogs passed by us. We ran into the foursome and their dogs again at the Mause Creek trailhead and found that they were planning on hiking the exact same loop as us and in the same direction (counter-clockwise) as well. We would periodically share the trail with them throughout the rest of the day. The road along Mause Creek is in rough shape and requires a vehicle with good clearance. Going past the outhouse at the trailhead, we crossed Mause Creek on a partially collapsed bridge and followed the continuation of the logging road up the valley. After a couple more creek crossings, we reached the junction with the trail leading to Horseshoe Pass. This junction is signed, but the tree that the sign is attached to has collapsed making it easy to miss. 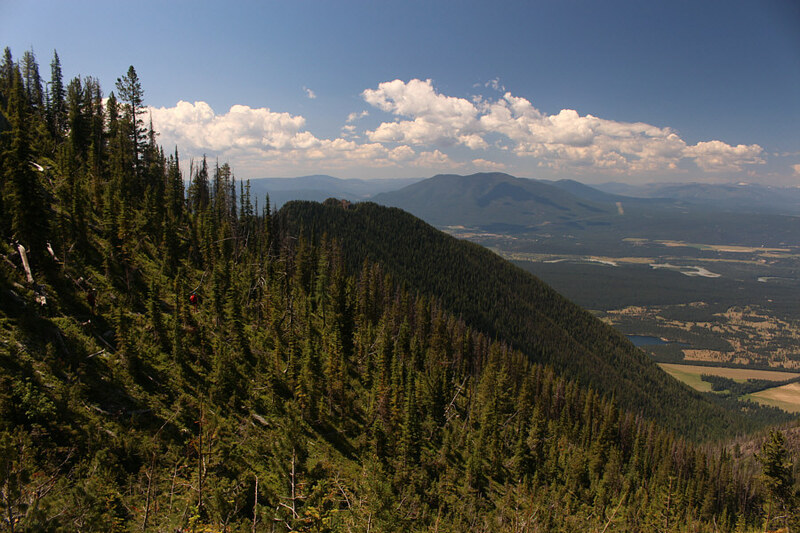 The climb to Horseshoe Pass is mostly in forest, but just west of the pass is a clearing with far-reaching views of the Cranbrook area. We stopped here briefly for a break before resuming our hike to Sunken Pass which is completely forested. 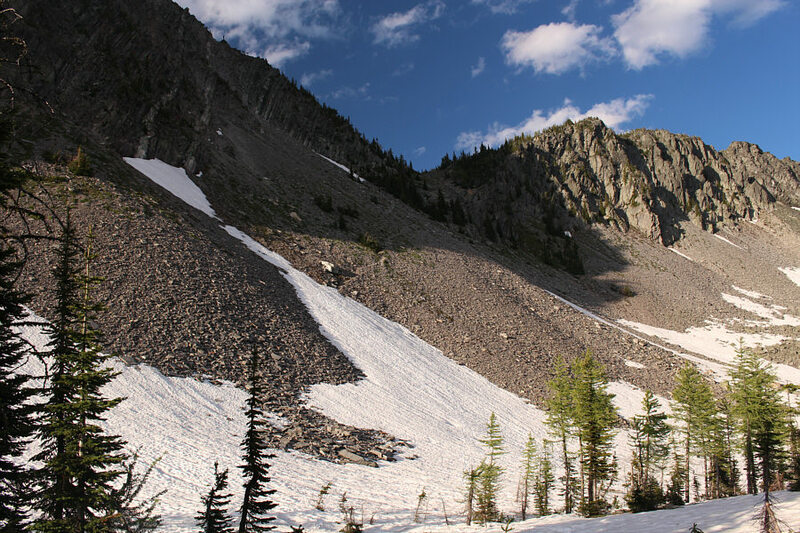 Beyond Sunken Pass, the trail drops steeply to a junction with Sunken Creek trail. It was a bit disheartening to realize that this junction is actually 100 metres lower than the Mause Creek trailhead! John watches Zosia carefully crossing Mause Creek on some downed logs. The group starts to climb out of Mause Creek valley after taking the turnoff to Horseshoe Pass. 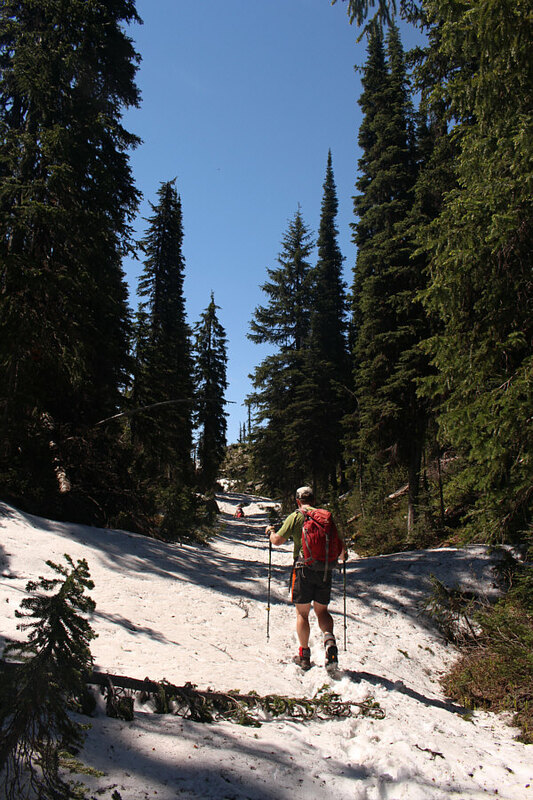 John hikes over some lingering snow patches just before Horseshoe Pass. 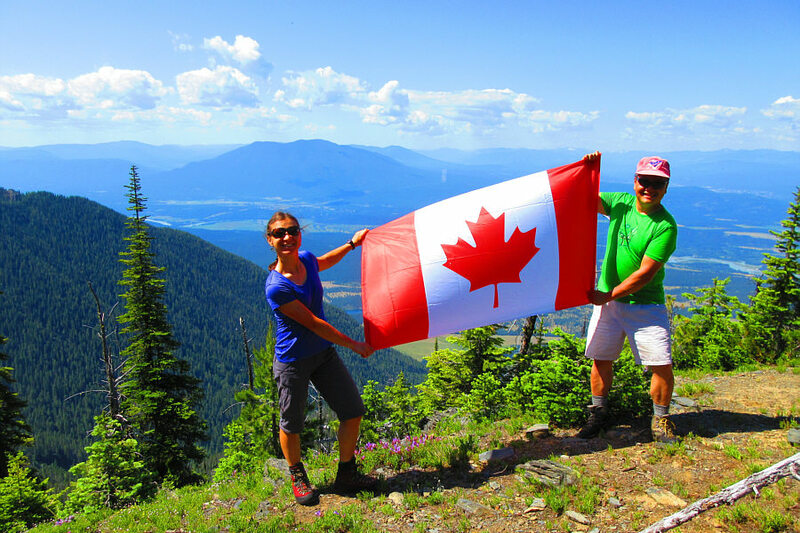 Even though it is the day after Canada Day, Zosia and Sonny are still celebrating the 150th anniversary of Confederation at a clearing near Horseshoe Pass. In the distance behind Zosia is Mount Baker. From Horseshoe Pass, the trail begins to descend to Sunken Pass which is just behind the ridge to the left. 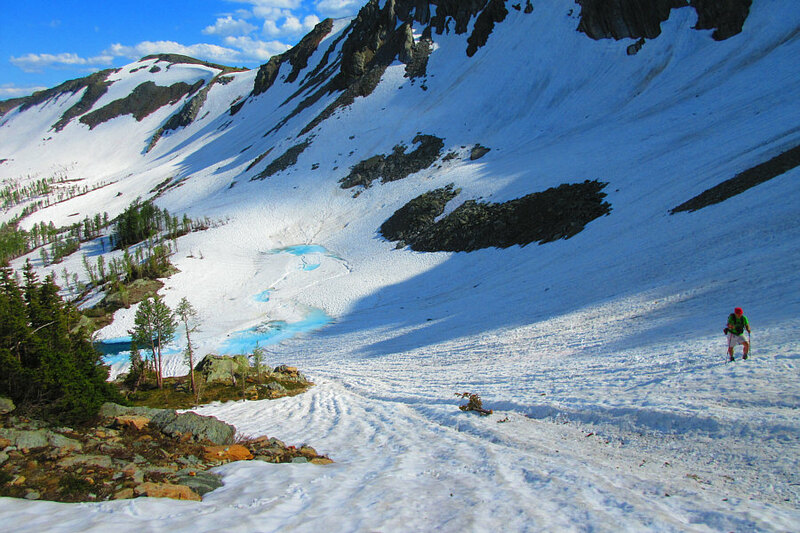 Beyond the pass, the trail continues to descend to the junction with Sunken Creek trail. 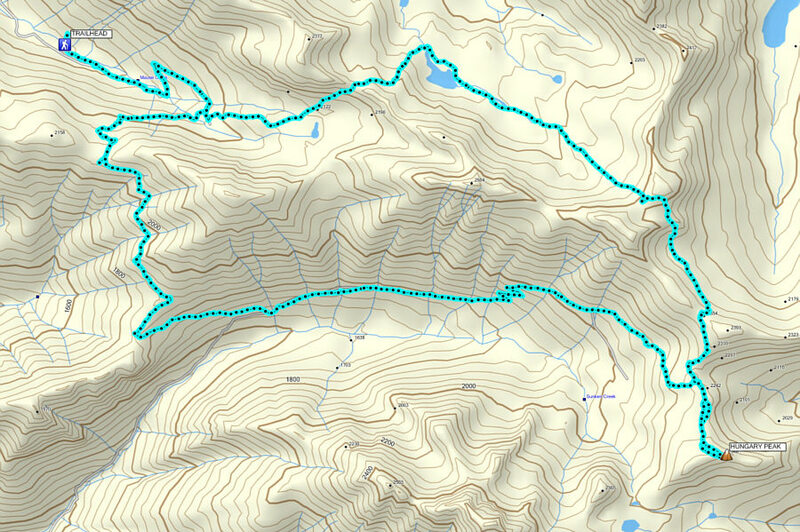 The junction is the low point of the entire trip (~1660 metres). Beyond the junction, we gradually climbed eastward up Sunken Creek valley. Temperatures soared at this point, and we tried to cool ourselves off by staying hydrated and seeking shade whenever possible. 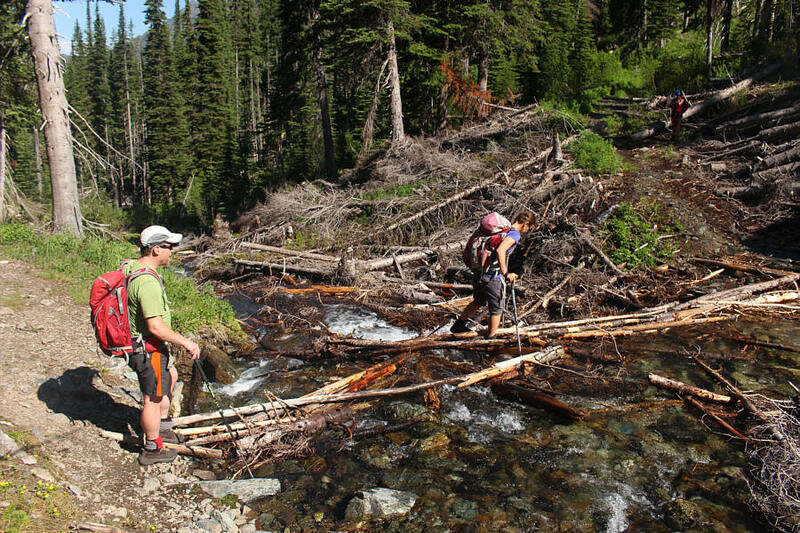 Numerous side creeks spilling across the trail were a godsend as they provided opportunities for us to soak our heads or shirts in the refreshingly icy waters. 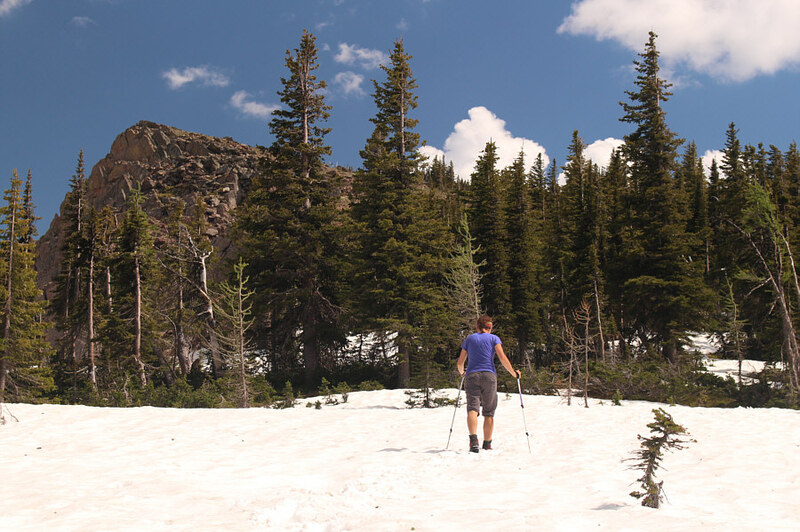 Toward the head of Sunken Creek, we began to encounter increasing amounts of snow which ultimately obscured the trail and made route-finding a challenge. The foursome with the dogs were ahead of us at this point, and they had an uncanny ability to rediscover the trail time and time again. We discovered later that they were not even using a GPS device! 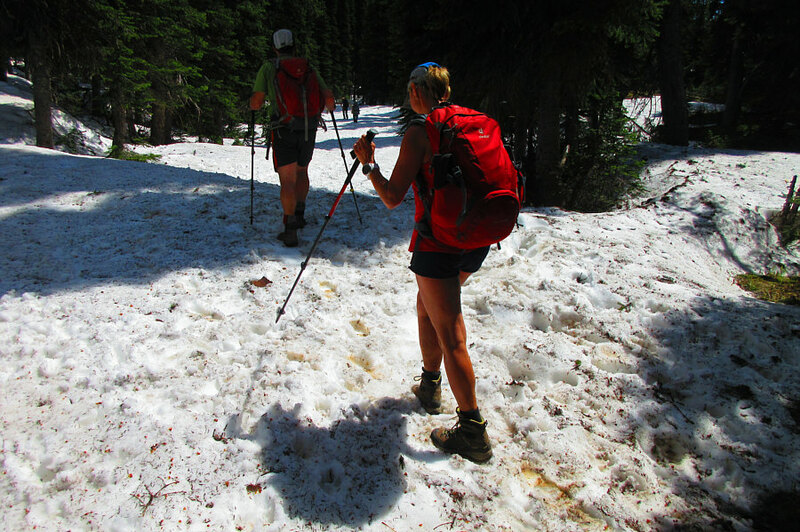 In any case, we gladly drafted behind them and followed their tracks through the snow which, thankfully, was still supportive. Numerous side creeks along Sunken Creek trail provide much needed relief from the hot temperatures on this day. Some breaks in the forest along Sunken Creek trail grant views of the north side of the Steeples. 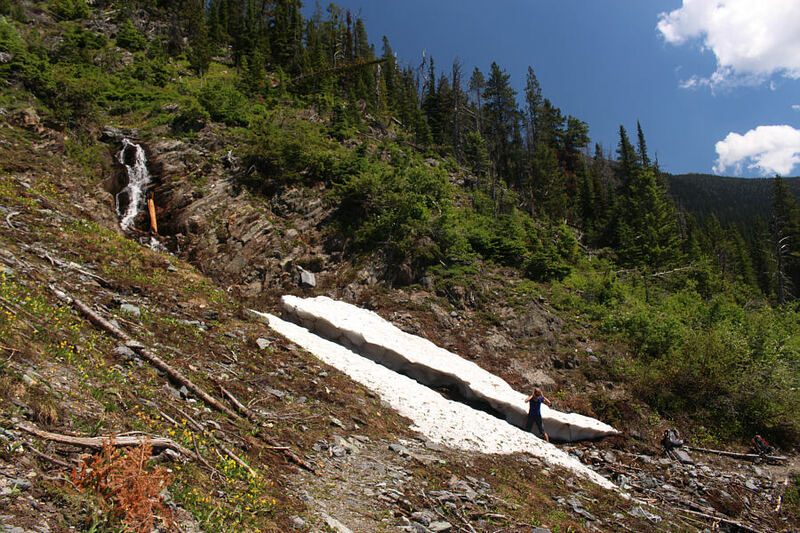 Despite an abundance of snow obscuring the trail near the head of Sunken Creek, John and Eva are able to follow the group of hikers ahead who seem to know exactly where the trail goes. When we reached Dibble Pass, Eva scampered off to tag the summit of nearby Hungary Peak while the rest of us stopped to have lunch. Eva returned within a short time to report that the ascent of Hungary Peak was easy, and when Zosia and I finished eating, we promptly set off to hike to the summit as well while John elected to stay behind with Eva at the pass. Amidst the grandeur of the Steeples and other higher unnamed peaks in the vicinity, it is curious that Hungary Peak should garner an official name let alone one that references a country on the other side of the world. 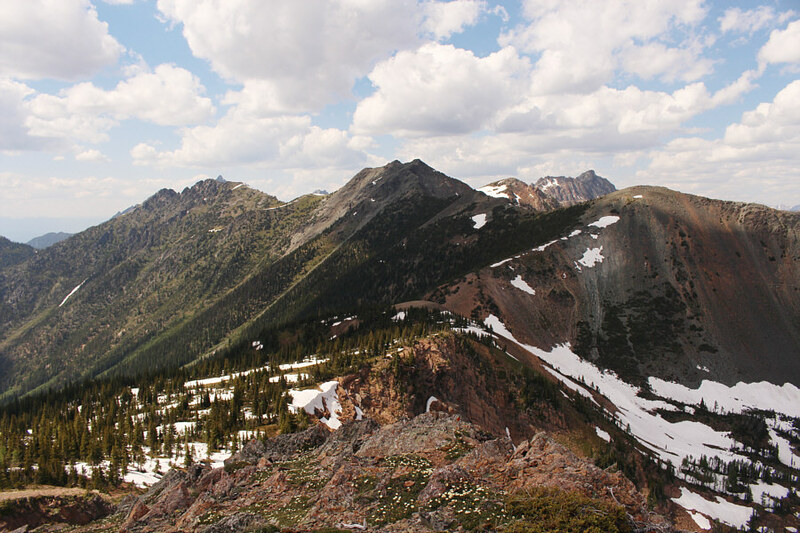 Regardless, the views from the summit were more than worth the paltry extra effort expended to get there from Dibble Pass. While it would have been nice to linger or even take a nap on the summit, the reality of a long hike still ahead of us prompted Zosia and me to hurry back and rejoin the others at Dibble Pass. 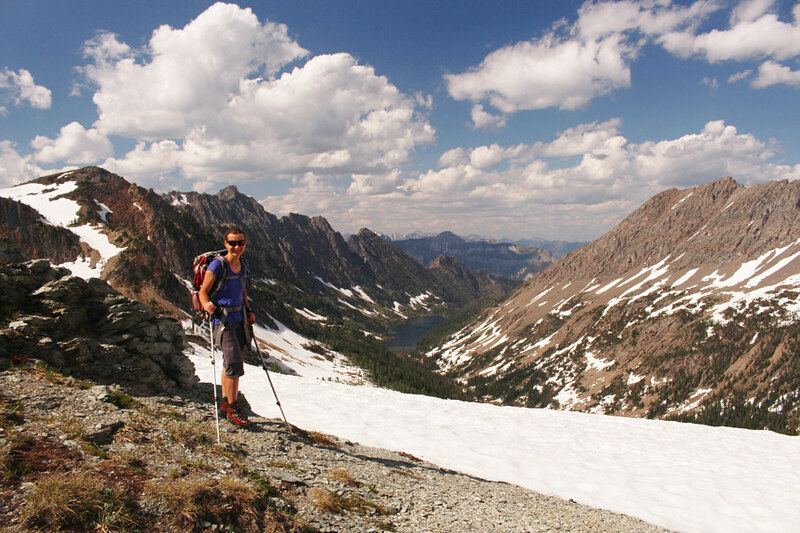 Zosia takes a detour from Dibble Pass to hike up Hungary Peak (left). The easy northwest slope of Hungary Peak present no challenges. 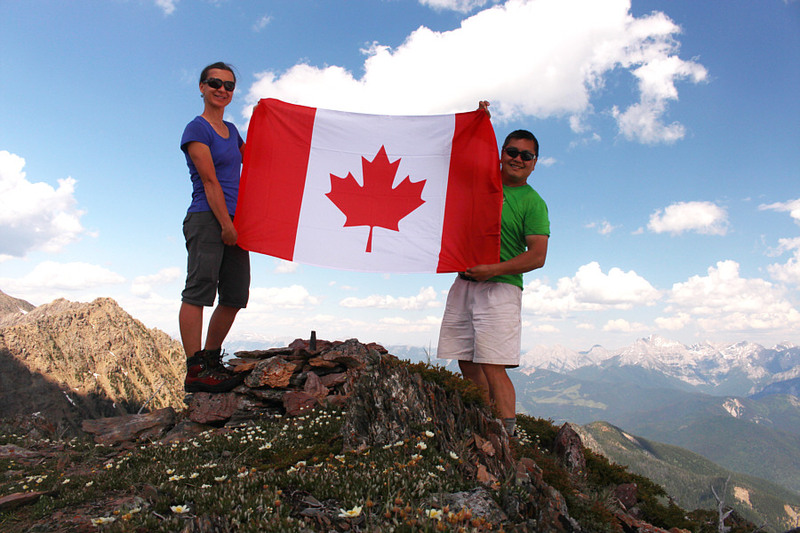 Zosia and Sonny hold up Canada's flag on the summit of Hungary Peak (2343 metres). The best reason for climbing Hungary Peak is to get this view of Dibble Glacier tucked on the northeast side of the Steeples. 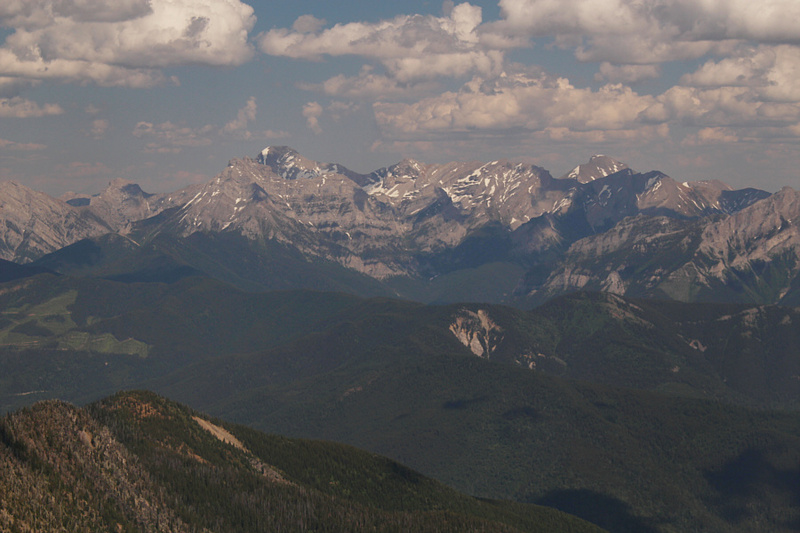 Visible to the east are Mount Bisaro (left) and Three Sisters (distant right). 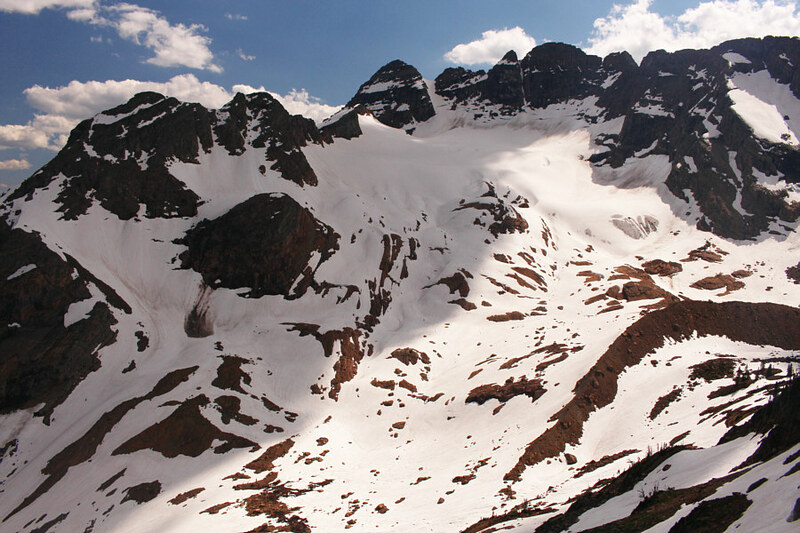 North of Hungary Peak, Dibble Pass is in the centre of the photo while Mount Patmore can be seen at distant right through Bear Pass. 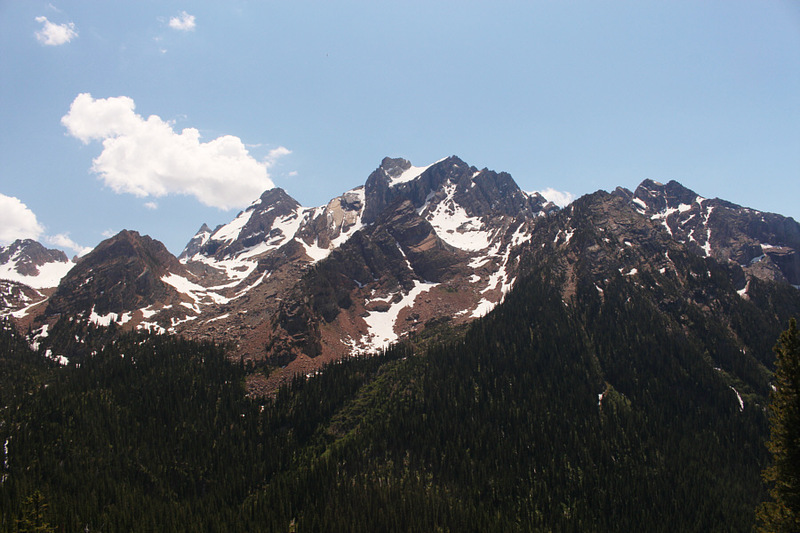 When we returned to Dibble Pass, Eva had already gone ahead to explore a few more high points to the north, but John stuck around just long enough to make sure that Zosia and I stayed on the right track. We all headed north on a good trail and climbed up to Bear Pass where we finally reunited with Eva. 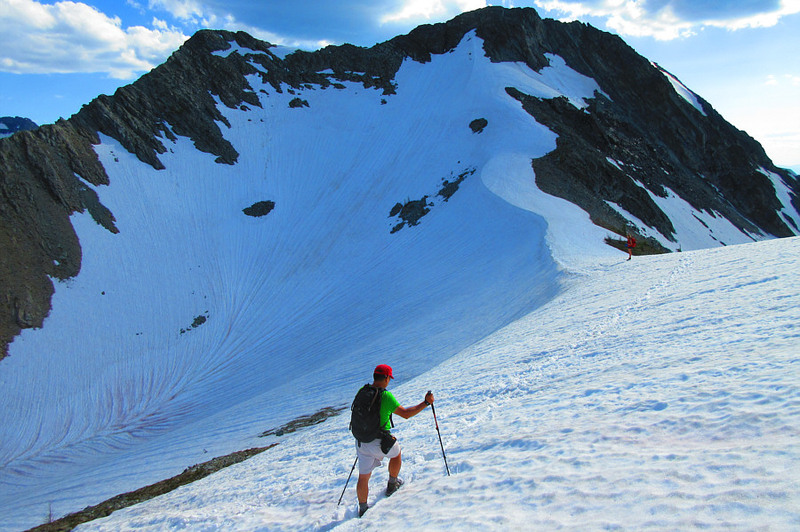 Beyond Bear Pass, we made a descending traverse across a large snow slope into the next basin. 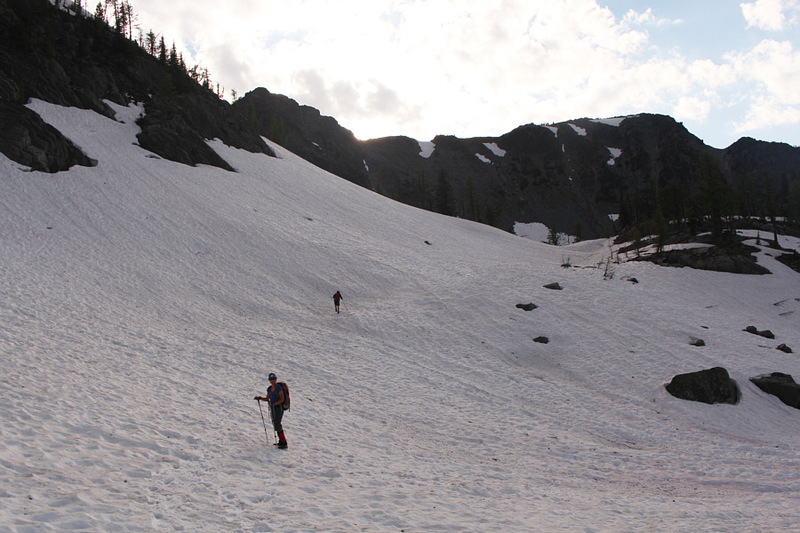 Although the run-out was generally safe, the steepness of the slope made the traverse a bit unnerving especially since we had neglected to bring crampons or ice axes. 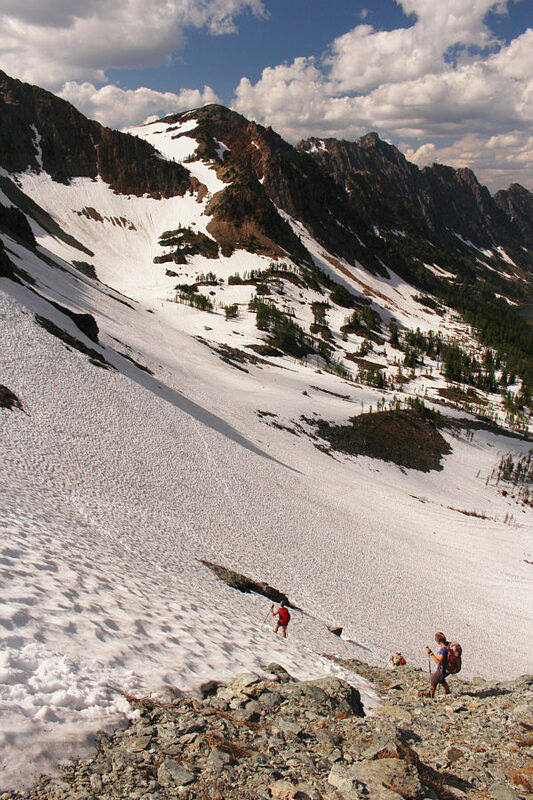 As we descended, we watched in disbelief as the foursome ahead of us climbed up a seemingly vertical wall of snow on the far side of the basin. We continued to follow their tracks anyway, and as it turned out, the wall of snow was not nearly as steep as it looked from afar. 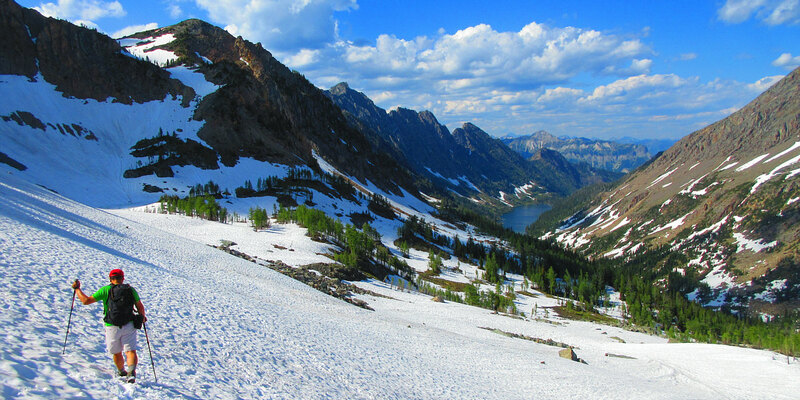 The grind up to Windy Pass was nevertheless lengthy, and by the time we crested the pass, I was feeling quite weary, especially after looking across the vastness of snow-filled Tanglefoot basin and trying to discern where we still had to climb over Tanglefoot Pass. 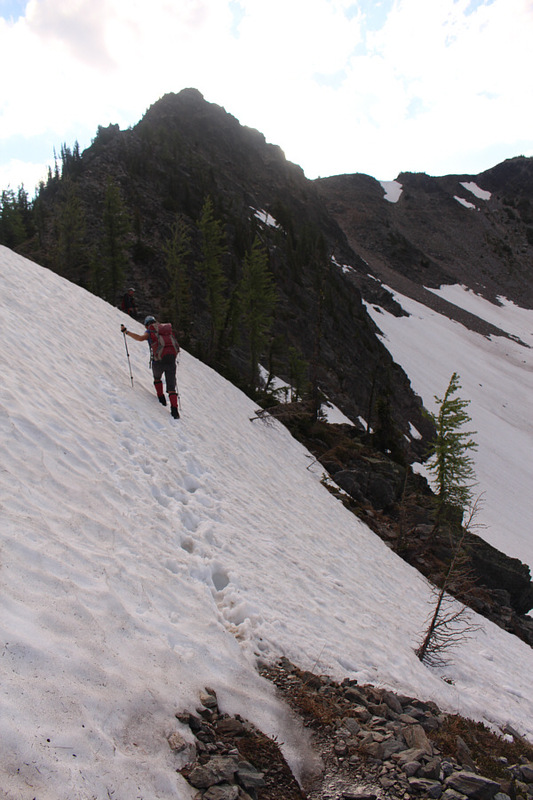 Fortunately, the heat had abated somewhat here, and the snow made the descent into the basin much easier on our feet. Again, we followed the tracks of the foursome ahead of us which saved us a lot of route-finding hassles. Tanglefoot basin is remarkably sublime, and it is a shame that we did not have the time or energy to explore it further on this trip. John and Zosia regroup at Dibble Pass. The trail continues up the ridge behind them and over Bear Pass (left of centre). 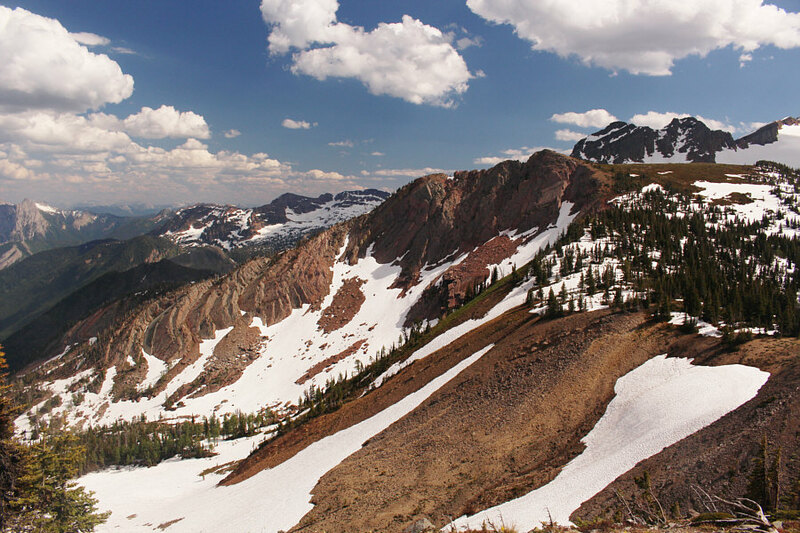 From the ridge leading to Bear Pass, here is a look back at Hungary Peak (right). 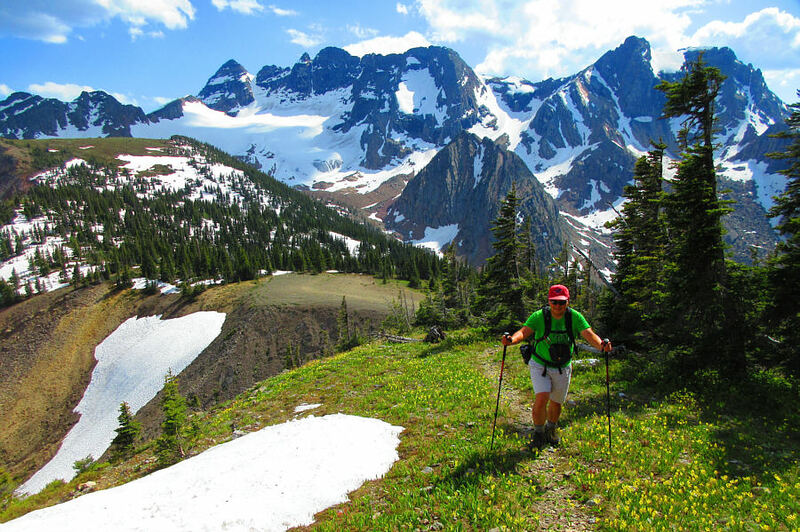 Dibble Pass (left of centre), Dibble Glacier and the Steeples provide a wonderful background as Sonny hikes up the trail to Bear Pass. Zosia pauses to enjoy the view of Cliff Lake from Bear Pass. 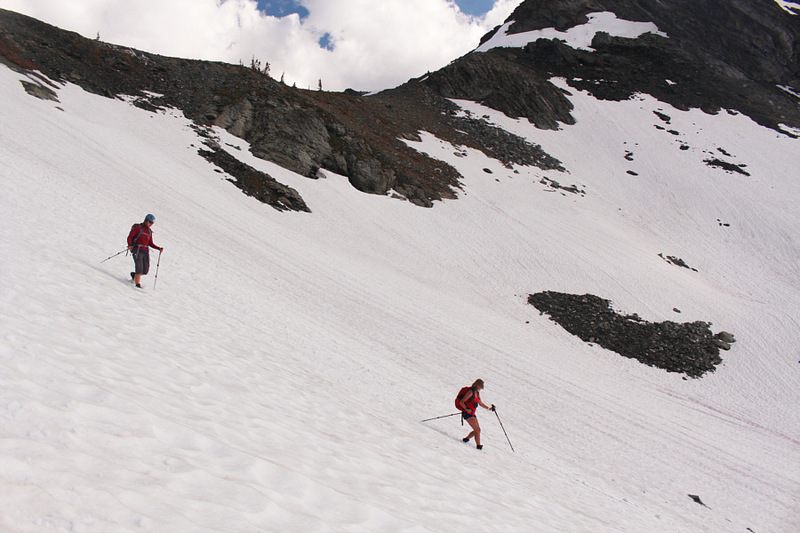 The group drops steeply down the north side of Bear Pass. Sonny ignores the beautiful surroundings in order to concentrate on his footsteps across the snow slope. Zosia follows Eva and John as they ascend the snow slope aiming for the weakness in the cliffs at upper right. 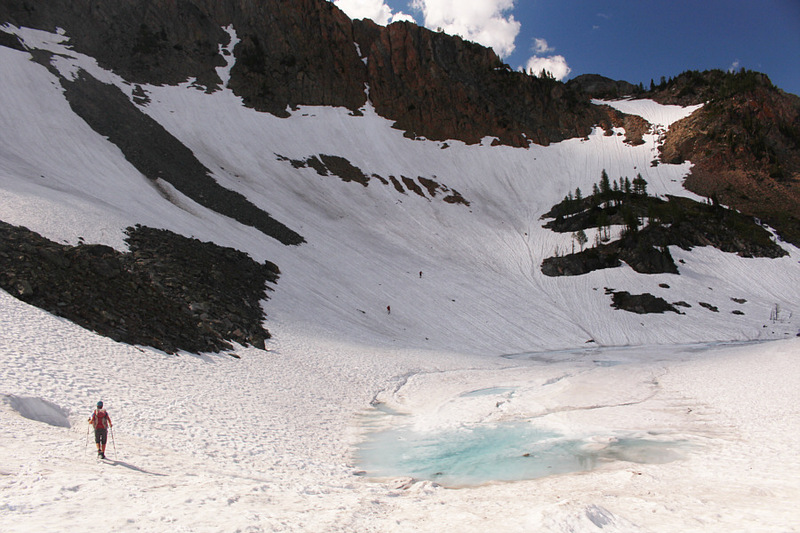 Sonny climbs out of the bowl north of Bear Pass (upper left). 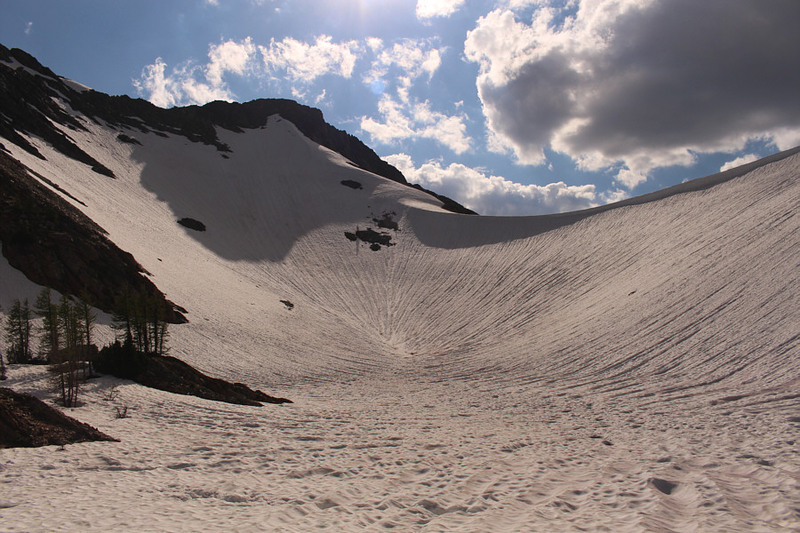 A snow bowl and cornice guards the east side of Windy Pass. Sonny follows Eva to the top of Windy Pass which is the high point of the entire trip (~2423 metres). 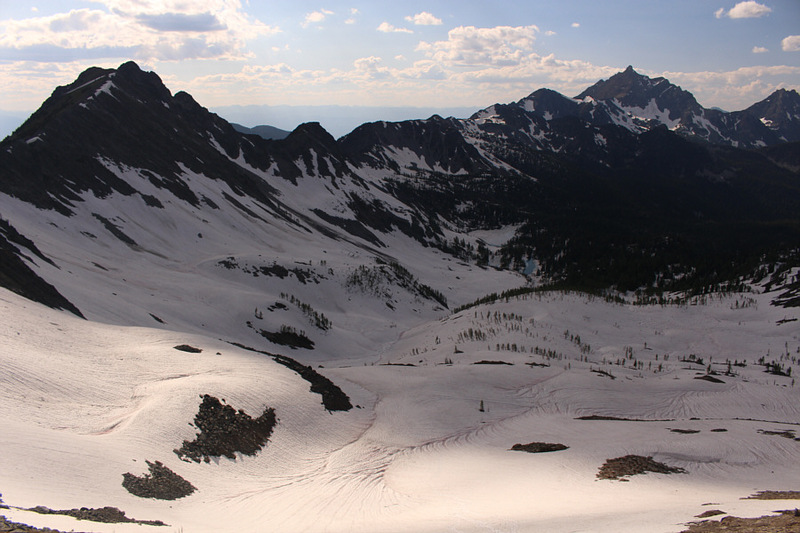 A lot of snow still sits in Tanglefoot basin in this view from Windy Pass. At distant right is Mount Fisher. Zosia and Eva plunge-step down the snow slope below Windy Pass. The group makes a beeline for Tanglefoot Lake. 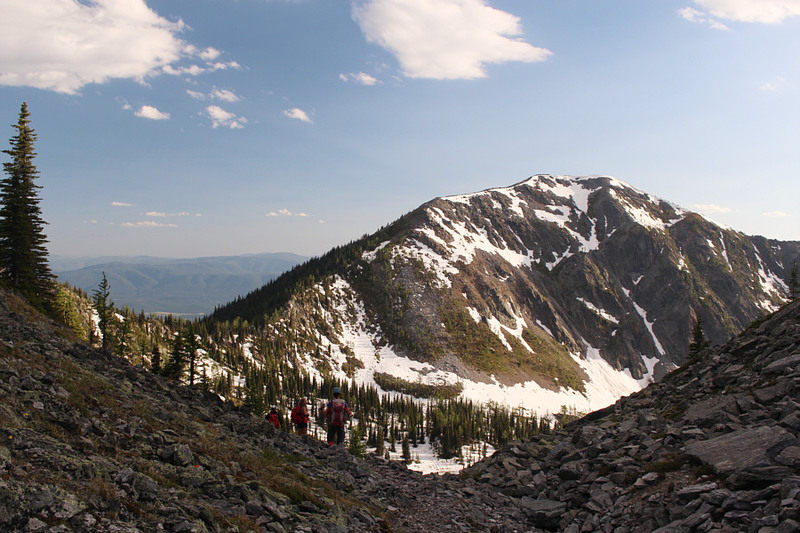 Tanglefoot Pass, the group's exit point, is at far left. Despite having wet feet and feeling fatigued, Sonny can still crack a smile. Behind him at left is Windy Pass. 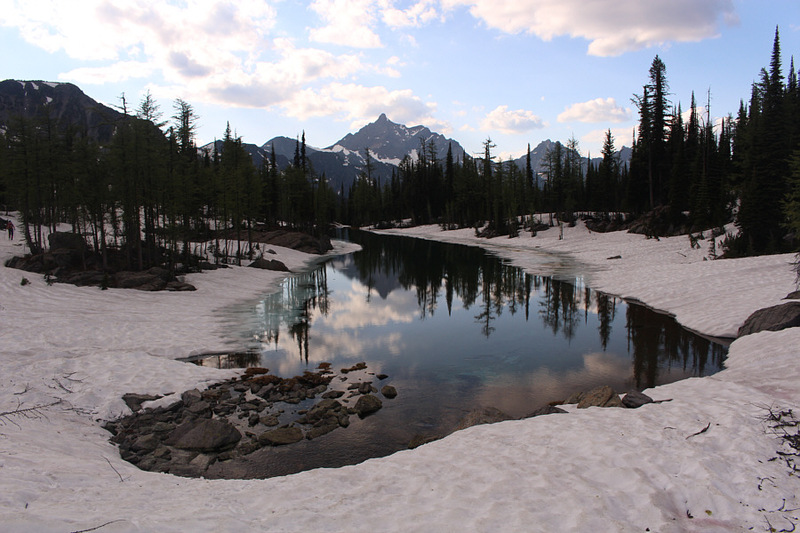 Mount Fisher is reflected in one of the tarns of Tanglefoot basin. The final climb of the day up to Tanglefoot Pass was not as tiring as I had anticipated, and we were soon descending a good trail into the basin at the head of Mause Creek. 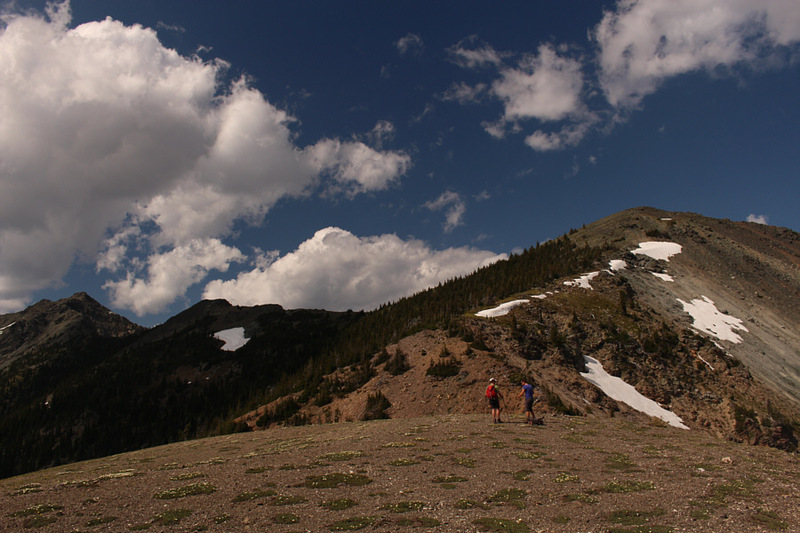 We caught up to the foursome with their dogs here, and together, we all hiked uneventfully back to the trailhead. On the drive out, John dropped Zosia and me off at my car at Mount Fisher trailhead, and we both made it out the rough Mause Creek FSR without any problems. Zosia and I subsequently parted ways with Eva and John at Fort Steele as they went in search of campsite while we returned to our hotel in Cranbrook. Zosia and John start to climb again to reach Tanglefoot Pass (out of view to the left). Late day sunshine illuminates the outliers of Mount Patmore. 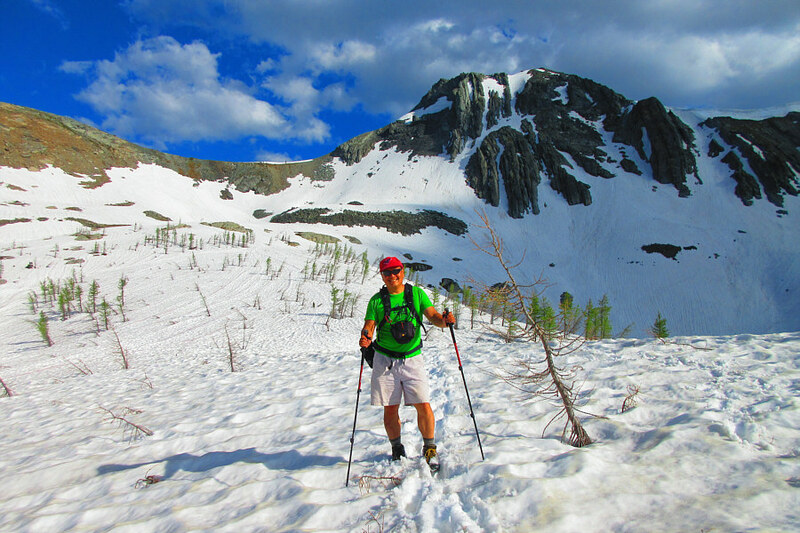 Zosia traverses one more steep snow slope just before Tanglefoot Pass. 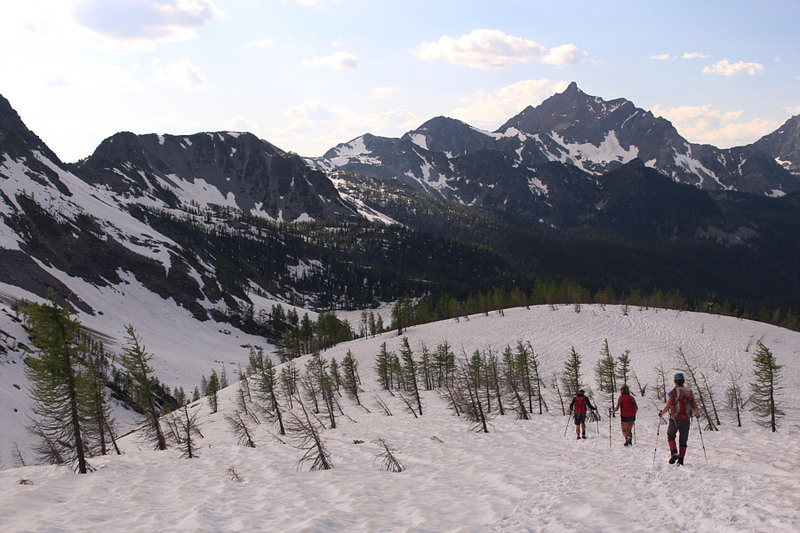 The group descends the south side of Tanglefoot Pass to re-enter Mause Creek valley. 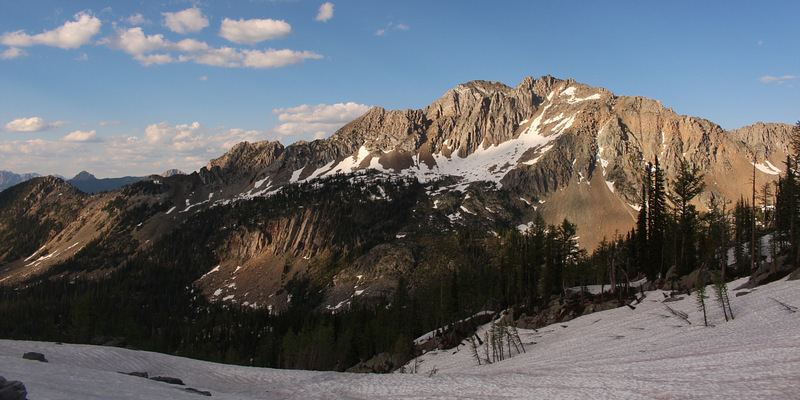 This is looking back up at Tanglefoot Pass from the upper Mause Creek basin. 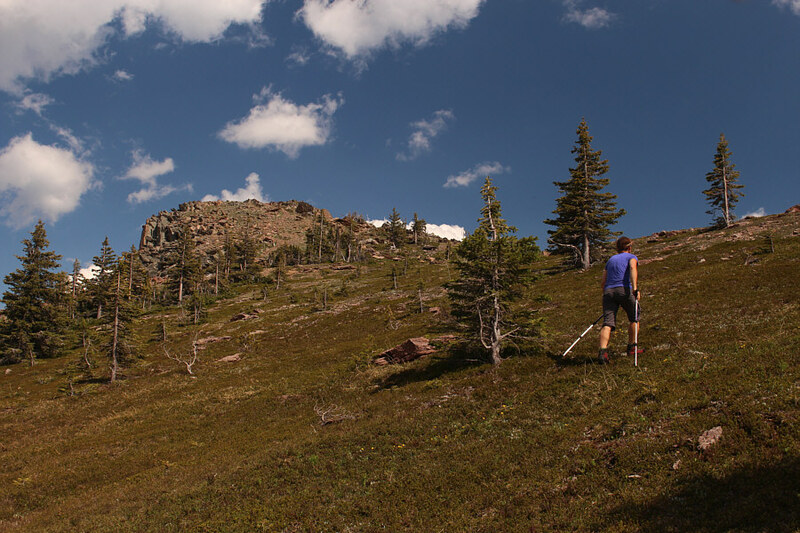 Eva, John and Zosia fool around with some cookies in upper Mause Creek basin.